Holme-next-the-Sea Beach01485 525149work BeachIn the relatively thin strip of land between the village and the sea, large areas of salt marsh much used by birds for feeding and breeding are to be found. On the Holme-next-the-Sea beach in the spring of 2050 BCE, a very large oak tree was felled and its stump was half-buried with the roots uppermost. About a year later, some smaller oaks were felled and from these 56 posts were cut. These were arranged in a circle around the upturned, central stump. This Bronze-Age monument, described by some archaeologists as being one of the most significant ever discovered, may have formed a type of ceremonial site - possibly with astronomical overtones. An alternative suggestion is that it may have been a site of 'excarnation' where, after death, bodies would be exposed to the elements to hasten the process of decomposition and help the spirit on its way to the afterlife. Eventually the sea claimed the land where the Bronze-Age circle stood and the people who built it were long forgotten. There were no records that it ever existed until, almost 4,000 years after it was built, the ever shifting sands off the East Anglian coast reformed and revealed the structure once again to the eyes of man. The amazing structure was soon christened 'Seahenge' and became famous as Druids and modern-day pagans objected, including sit-in protests, against the decision by English Heritage to dig up the whole structure, remove it from the beach and preserve it. Following a £1.2 million redevelopment the Lynn Museum in King's Lynn is now home to about half of the original timbers which are displayed in surroundings designed to replicate the beach site where they were discovered. There is also a life size replica of the Bronze Age circle. The entire display is accompanied by a free audio guide and interactive features which provide information about the people who created the monument and the details revealed by a study of the timbers. 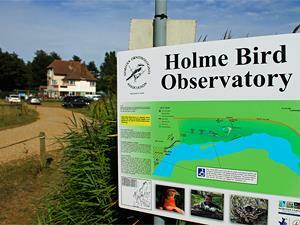 This part of Norfolk is very popular with tourists and attracts visitors throughout the year. During the summer months the large beaches appeal to families, especially those with children, and at other times, notably during the spring and autumn migration periods, bird-watchers are always present. The town of Hunstanton is nearby, about 3 miles to the south-west, so why not venture to quieter Holme-next-the-Sea after a trip to the seaside town? In the relatively thin strip of land between the village and the sea, large areas of salt marsh much used by birds for feeding and breeding are to be found. There are main line railway stations at King's Lynn (15 miles) connecting with London King's Cross/St. Pancras, Peterborough (42 miles), Norwich (44 miles) and Cambridge (62 miles). Norwich (42 miles), London Stansted (90 miles). King's Lynn has a large bus station with routes to many destinations in Norfolk. Hunstanton has a smaller bus station with connections to King's Lynn and Cromer. The Coasthopper bus service connects King's Lynn to Cromer via Hunstanton along the A149 main east/west road. This popular service calls at most villages and towns, including Holme-next-the-Sea.